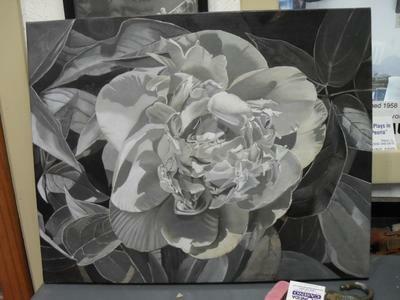 This painting started as a photograph of my neighbor's peony plant. I then used an overhead projector and enlarged on a 16x20 canvas. The canvas was prepared with 2 layers of modeling paste with half white gesso. Then completing the drawing and inked in the lines. 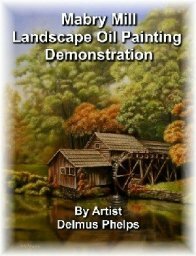 Secondly, toned as learned from Delmus's The Yellow Rose oil painting demonstration on DVD. Oh by the way, thank you very much Delmus, the info in the Dvd was fanastic, and overwhelming, it has opened new avenues and made some exciting discoveries in these new techniques. I included the completed dead along with final color painting. Thank you Michael for these very kind words. They have given me such inspiration! 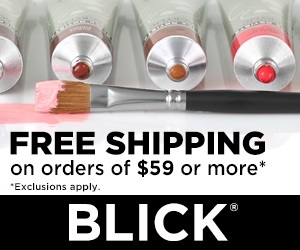 With spring, it is always busy here, and the paint studio gets left behind. 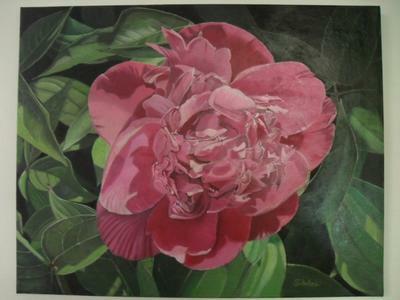 You've sparked my interest in my own peonies, and while they are in full bloom, I will need to try to get them to canvas too! Your painting is indeed beautiful! I am so happy for your success with this most difficult of flowers to paint. So many pedals! what a wonderful sense of realism you have achieved love it!. Michael, A magnificent painting,Beautiful painting. I really appreciate your choice of colors in the leaves keeping it bright and vibrant. I only hope I can do a well as you did with Delmus helping and sharing his techniques. Again your peony is lovely.